Out of Stock, generally 2-3 days to Order your Copy and have it arrive. 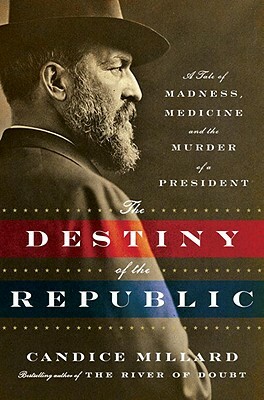 James A. Garfield was one of the most extraordinary men ever elected president. Born into abject poverty, he rose to become a wunderkind scholar, a Civil War hero, and a renowned and admired reformist congressman. Nominated for president against his will, he engaged in a fierce battle with the corrupt political establishment. But four months after his inauguration, a deranged office seeker tracked Garfield down and shot him in the back. But the shot didn’t kill Garfield. The drama of what hap­pened subsequently is a powerful story of a nation in tur­moil. The unhinged assassin’s half-delivered strike shattered the fragile national mood of a country so recently fractured by civil war, and left the wounded president as the object of a bitter behind-the-scenes struggle for power—over his administration, over the nation’s future, and, hauntingly, over his medical care. A team of physicians administered shockingly archaic treatments, to disastrous effect. As his con­dition worsened, Garfield received help: Alexander Graham Bell, the inventor of the telephone, worked around the clock to invent a new device capable of finding the bullet. CANDICE MILLARD is the New York Times bestselling author of The River of Doubt. She lives in Kansas City with her husband and children. "Fascinating......Gripping.....Stunning....has a much bigger scope than the events surrounding Garfield’s slow, lingering death. It is the haunting tale of how a man who never meant to seek the presidency found himself swept into the White House. . . . Ms. Millard shows the Garfield legacy to be much more important than most of her readers knew it to be." "Fascinating....Millard colorfully recreates the political milieu of 1880....The story is a natural for narrative history. Millard has created a readable and colorful account." "Millard chronicles all this with precision and skill. She creates a vivid portrait of the times, a vulnerable nation, political hardball, nightmarish decision-making and the eloquent Garfield, who's a footnote for generations of high school students. She covers topics as diverse as the fiefdom of New York senator and patronage dispenser Roscoe Conkling, and the mind of Alexander Graham Bell, working on an electrical device to find the bullet lodged in Garfield's back. Millard seamlessly unfolds multiple tales....Millard finds the ironies of history throughout this stirring narrative, one that's full of suspense even though you know what's coming. She makes you a witness, not a reader." "[Millard demonstrates] the power of expert storytelling to wonderfully animate even the simplest facts....make[s] for compulsive reading. Superb American history"
"Splendidly insightful....stands securely at the crossroads of popular and professional history"